You might not want it, but someone just round the corner might. All around the country there are Freegle Groups and Freecycle Groups, they provide online listings of wanted ads and offered ads. Find your local group and free gift the items you don’t want to someone who needs or wants it/them. You might need something, in which case sign up, search for the item or post a wanted ad for free. The central West Sussex Freegle Group is Steyning Freegle Group and there is a central West Sussex Freecycle Group in Horsham. All items must be legal and appropriate, and free. No loans, swaps or sales please – just free gifts. Find your nearest Freecycle group here. Find your nearest Freegle group here. 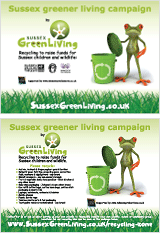 Sign up Sussex and get recycling rather than filling up the landfill!